The most powerful tool for place information and ratings! This is the most detailed U.S. place info available – more complete than the BestPlaces.net website and any of our competitors. On a 1-10 scale, see scores for Livability, Affordability, Economy, Culture, and Weather. Includes median housing prices, restaurants, climate and comfort rankings including sunny and rainy days, unemployment rates, median income, average life expectancy and health quality, crime risk, commute times, education scores, air quality and cancer risk, cost of living scores, and much more. 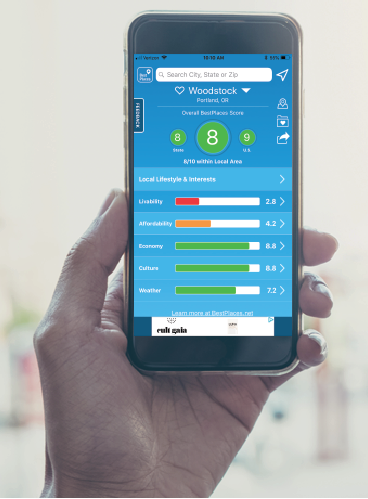 The BestPlaces app gives you comprehensive place ratings for all 217,000 block groups across the United States – pinpoint information down to the detail of a few city blocks. Using mobile device geolocation for a level of accuracy and insight that is not available via desktop computer or laptop, this is the most detailed U.S. place info available – more complete than the BestPlaces.net website and any of our competitors. The free version of the app lets you access data for the exact location in the United States you are currently standing or driving. The paid version unlocks the full app functionality and lets you search and save locations anywhere in the United States.